This guide will help you activate Corona Renderer using different methods. It also features a list of common problems and solutions. Download the Universal Installer from: https://corona-renderer.com/download/ and install Corona Renderer on your machine. Locate your registered email address and password if you are using a FairSaaS license, or workstation serial number if you are using a Box license. All activation credentials were sent to the email address you provided when buying Corona Renderer. Run 3ds Max, set Corona Renderer as your active renderer, and hit render in any (even empty) scene. A window prompting for activation will pop up. Note: if you have previously activated the Demo, or another license, first go to Render settings > System > About Corona Renderer/Licensing, and click the "Remove license" button. If it can connect to the activation server: will prompt for your registered email address and password, or serial number. Just input them and that's all. If it cannot connect to the server (either the computer does not have Internet access, or firewall blocks 3dsmax.exe): request code will be shown together with an activation link. Visit the link ( https://corona-renderer.com/customer-zone/ ), select your license type, log in or input your serial number, then input your request code. The page will display your activation code. Just copy it back to Corona Renderer activation window, and that's all. 5. Corona Renderer is now activated. You can see the license status in the Render Setup > System > About Corona Renderer / Licensing rollout. Note: to de-activate your current license, go to Render Setup > System > About Corona Renderer / Licensing rollout and press the "Remove license" button. To activate the license again, use the above procedure. This is useful for example when changing license types (upgrading). The easiest way to activate Corona Renderer on multiple computers over LAN is using our Corona Licensing Server. It is especially useful for render farms. If you own a FairSaaS license: reset your password here https://corona-renderer.com/customer-zone/password-reset to send a new password to your registered email address. If you own a Box license: contact us, and we will send you your serial number. The server says "Too many activations"
The number of computers that can be activated is limited by the number of licenses you have purchased. Please especially note that Box licenses are not floating. If you suffered a hardware failure or need to re-host your Box license to a different computer, please contact us. You will also get this message if you try to activate Box license as FairSaaS. If you own a Box license: you can save the request code, input it here: https://corona-renderer.com/customer-zone/ (from another machine), and then input the activation code manually. If you own a FairSaaS license: you can either use the same technique as for Box license, or you can use our licensing server, if there is another machine on the network which has Internet access. The most probable cause is that you are using different user accounts, or just running applications under different accounts. The activation is per-user, so each user needs to activate the license separately. Note that activating the license for different users on a single computer does not count towards the activation limit. Please see this short guide. The "Activated until" date printed in Render Setup > System > About Corona Renderer / Licensing is NOT a date when Corona Renderer will stop working for you. 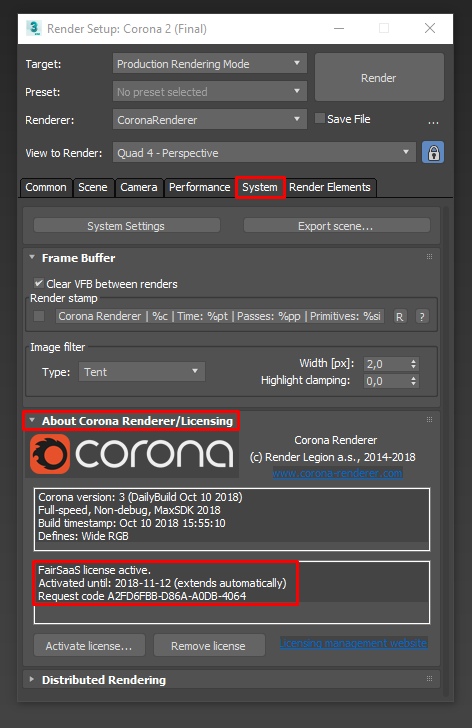 It shows a future date, at which the license will be automatically extended, provided that the computer is connected to the Internet or visible to the Corona Renderer Licensing Server. Don't worry if that period is shorter than expected - it will get automatically extended anyway. If you experience any other problems with the activation process, please contact us, and we will be happy to help you.